Our January recipe is a guest favorite… probably our most-requested recipe: our Pumpkin Belgian Waffles. 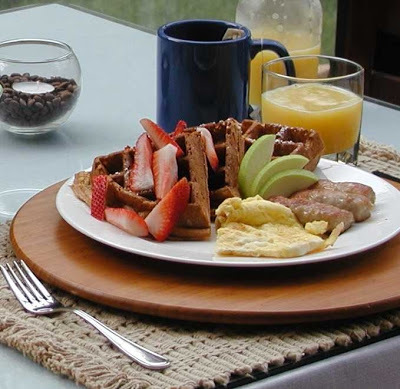 We typically serve our Belgian waffles with eggs and sausage, and depending on the season, we’ll top them with fresh blueberries or strawberries, or add melon, pears and/or kiwi on the side. We were delighted to see our waffle recipe featured as one of A Bloggable Life’s Best of Breakfast recipes in Sandie’s Inn Cuisine section. We hope you enjoy these waffles as much as we do! In another bowl, lightly whisk together egg yolks, then one at a time whisk in butter and margarine, pumpkin, brown sugar, and the milks. Refrigerate wet mix for 5 minutes. When chilling time has elapsed, add wet ingredients to flour mixture, stirring until just moistened. In a clean bowl, beat egg whites until soft peaks form; fold into batter. Refrigerate combined batter for another 5 minutes. Cook in preheated Belgian waffle iron; this batter will take slightly longer than most other batters (5+ minutes).